"Yelp! Reviews for Paul Mallouk, DDS"
I just left Dr. Mallouk's office with a spring in my step. Went in for a chipped filling and was gearing myself for that hated shot of novocaine, only to be told that for my filling there would be NO shot, NO novocaine, NO pain! You can understand my scepticism, especially after years of extensive dental work. Apparently, they are using a new laser equipment that works on the surface of the tooth.... AND, there was no pain! 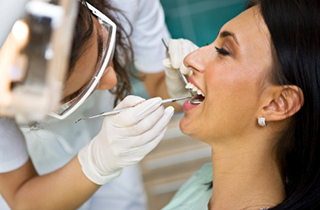 Now if your tooth is susceptible to cold/hot, then that novocaine shot will still have to be administered. This painless revelation coupled with the fact that they can make your crown on a same day appointment is awesome. This is truly the wave of the future. Now if we can only get rid of those injections, life would be sweet. "I Never Had A Complaint"
Love Dr. Mallouk's office. I'm never a fan of the dentist, but he's wonderful. His staff is great too, always friendly. I'm the one that hates getting my teeth worked on, but I never have a complaint while I'm at his office. Never painful or uncomfortable. I realize that most people hate the dentist; however, I really do like mine. Dr. Mallouk is fantastic. He's always pleasant and has never caused me the least bit of discomfort. Which is saying a great deal since he is a dentist. The staff is always great and I honestly can't think of anything negative bad about my experience with them. Even though they are located in my home town of Delano, CA, I still commute from L.A. for appointments. I've done this for years now and even while I was living in Northern California during and after undergrad. I will continue to do so until I move out of state or out of the country.